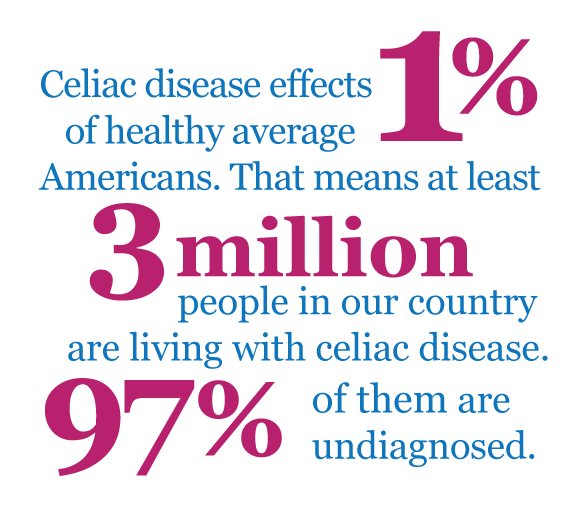 I found these statistics at CeliacDisease.org. Number seven was disturbing to me. I hope that as this information becomes more widely known, more people will be able to get a proper diagnosis. In the landmark prevalence study on celiac disease, investigators determined that 60% of children and 41% of adults diagnosed during the study were asymptomatic (without any symptoms). During the prevalence study, researchers found that 21% of patients with a positive anti-endomysial antibody test could not receive a biopsy due to the refusal of their physician to perform the procedure or the insurance company to pay for it. Only 35% of newly diagnosed patients had chronic diarrhea, dispelling the myth that diarrhea must be present to diagnose celiac disease(1). 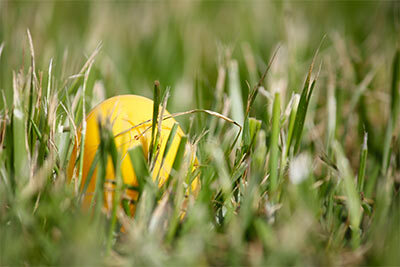 Celiac disease affects at least 3 million Americans. The average length of time it takes for a symptomatic person to be diagnosed with celiac disease in the US is four years; this type of delay dramatically increases an individual’s risk of developing autoimmune disorders, neurological problems, osteoporosis and even cancer(2). (1) Source: A multi-center study on the sero-prevalence of celiac disease in the United States among both at risk and not at risk groups. Fasano et. al., Archives of Internal Medicine. February 2003. (2) Source: Characteristics of adult celiac disease in the USA: results of a national survey. Green, P.H. et.al. American Journal of Gastroenterology, 2001, 2006. I found a bone under some leaves in the yard today. I forgot that I put it there. What a GREAT day! I was reading an article the other day about using pureed avocado to replace the fat in gluten-free baked goods. It’s supposed to help the batter retain moisture and stick together better. I decided to give it a try with this recipe. I replaced part of the coconut oil with avocado. You can’t taste it at all and they turned out really moist and not crumbly. I used about 2/3 of a large avocado, but I think I could have used the whole thing. These bars are great for breakfast! I didn’t put frosting on them, but there is a link below to Karina’s cream cheese icing if you want to frost them. (Karina’s photos are always so lovely!) I also added a handful of coconut because I had some and it sounded good to me. 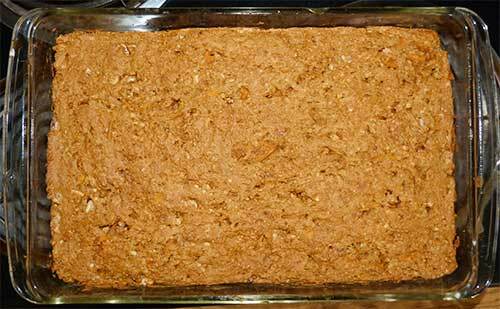 I added about 1/3 cup of coconut with the walnuts and left out the raisins. The batter is thick enough to hold up a spoon. Spread the batter evenly in the baking pan. Bake in the center of the oven for about 22 minutes until firm to the touch. Cool on a wire rack. Frost with vegan cream cheese icing- find Karina’s Maple Cream Cheese Icing recipe here. Chill frosted bars before wrapping, to set the icing. These freeze beautifully. Remove wrap before defrosting to keep the icing from sticking. Makes 24 small bars. The wind blew my Frisbee over the fence, but Maizy went and got it. I would like to BITE the wind and I think Maizy would, too! 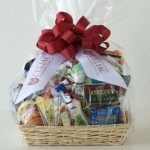 The care package is sponsored by the University of Chicago Celiac Disease Center and receives items from about 25 different companies that make gluten-free products. In addition to gluten-free food samples, the package also includes a gluten-free food guide and support group information. They ship via UPS to anywhere within the USA. I think this would be an especially nice gift for a child that is newly diagnosed with celiac disease. You have to fill out their questionnaire and provide your test information and your physician’s contact information so they can verify that you are truly celiac. They have a Facebook page where they post photos of the recipients. This website has a lot of good information to help people learn about celiac disease and how to live with it. The Celiac Disease Center also offers free blood screening to 500 people every fall. That’s a big help for people in the Chicago area who don’t have insurance. Remember, you have to be eating a regular, gluten-containing diet for the blood test to be accurate. Isn’t this a great idea! I’m really glad there are so many resources available for people with celiac disease now. The most FUN thing in the world is when Maizy throws the Frisbee and I run as fast as I can and CATCH it! Sometime I have to jump up to catch it. Sometimes I just jump up because it is so fun and then I growl a little and shake the frisby. I LOVE Frisbees! I had never heard of the Liebster award until a few days ago when I was nominated by The Home Cook over at Mermaid’s Tresses. So I did a web search and discovered that this is a way to honor bloging newbies and help them get more attention. How cool is that? The rules ask you to thank the person who presented the award to you (Thanks Ms. Cook! ), have the award on your post, answer the questions that have been asked, award the same to five other upcoming blogs with less than 200 followers, ask ten questions to them and list some random facts about yourself. I wanted to share my new found love of sorghum for gluten-free cooking and I thought having to try at least one recipe per week would help me stay with it. I also thought this blog would be a way for me to keep researching celiac disease and find new ways to deal with it. I decided to include Milo because he always has an opinion about everything. Milo Says: Maizy takes me EVERYWHERE with her and we always have FUN! I like real food, especially when it has been grown in my garden. Anything cooked from scratch with fresh ingredients is good to me – as long as it’s gluten-free! Milo Says: I like fresh cooked MEAT and BONES and anything Maizy is eating! I used to be a coffee addict, but have recently given it up. Now I’m trying all different kinds of teas. I like all kinds of desserts, but I try to keep my sugar consumption down as much as I can. No HFCS! 4. If you could only watch one tv show for the rest of your life, what would it be and why? I don’t watch that much tv – mostly movies. Maybe NOVA on PBS because I like science stuff. 5. What is your favorite meal to cook? Any kind of soup with fresh meats and vegetables. Milo says: I can’t cook because of the no thumbs thing. There are too many to pick one. Milo says: Books DON’T taste very good. A couple of times to Mexico. Milo says: And you didn’t take ME? Here We Are: an introduction to me and Milo. Milo Says: I’m still waiting for my sorghum dog cookies…. 9. Which of your childhood memories is the prettiest one, please be brief. I loved horses when I was a kid. Milo says: What’s a horse? The birth of my son in 1982. He’s a man now – how did that happen? Milo says: The day Maizy brought me to live with her. WAG! GlutenFreePSD because they’re in Britain and I’d like to visit there some day. It’s also fun to see what celiacs in other parts of the world are eating. Gluten Free? Gimme Three! Because she taught me the difference between cross-contamination and cross-contact. The Celiac’s Chow for good reviews of gf products and amazing photos of Iceland. Real. Food. Now. Because they understand the relationship between food and nutrition. Milo Says: I want to nominate Klip Joint Dog Grooming because I go there to see my friend Mary Lynne. She gives me a bath and trims my toenails (I don’t like the toenail part!) and then I get a COOKIE! I love trying new recipes, making things out of yarn, reading books, art and animals. Milo Says: I love catching frizbies, going to the dog park and COOKIES! The other day I was talking with a co-worker about eating my mom’s homemade peach cobbler when I was a kid. 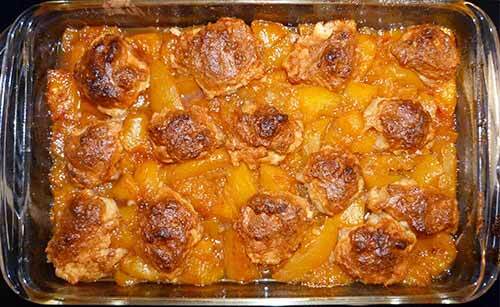 I hadn’t had peach cobbler in many years and started thinking about whether I could make it gluten-free. I looked in the gluten-free cookbook I have at home, Carol Fenster’s Gluten-Free Quick & Easy and found the recipe below. 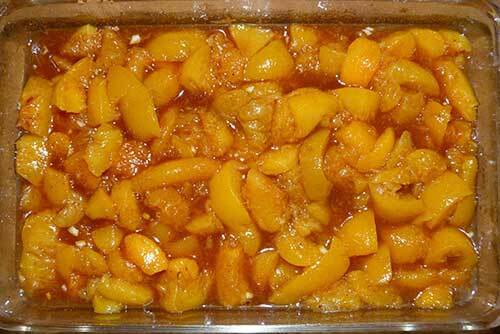 These are the peaches I put in the cobbler. 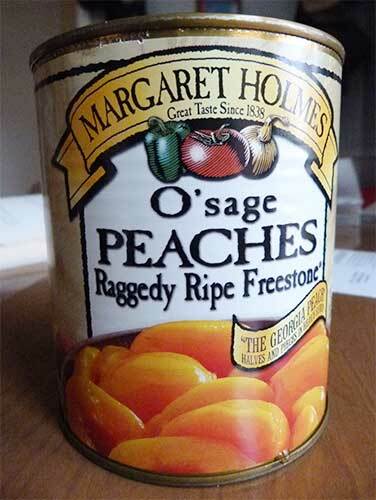 I would have preferred to use fresh peaches, but they aren’t in season right now, so I used canned peaches. I used two large cans and I think it was a little too much. The cobbler turned out pretty good, but I have to say it didn’t really taste like “mom’s” cobbler. The dough just sits on top of the peaches and doesn’t spread out, so there were little balls of cooked dough scattered across the top of a LOT of peaches. Peaches mixed with sugar and cinnamon, ready to put in dough. In a large bowl, toss the fruit with the sugar, lemon zest, cinnamon and salt until combined; spread in the prepared pan. In a food processor, combine the butter, flour blend, sugar, lemon zest, baking power, xanthan gum and salt by pulsing a few times. Add the egg and vanilla, and process until the dough is fully blended. 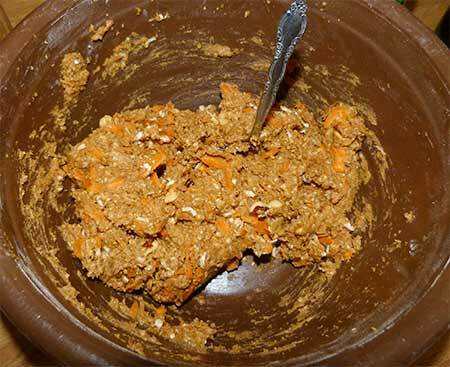 Drop the topping mixture onto the fruit by tablespoonfuls; do not spread it out. Bake 35 to 45 minutes, until just starting to brown. Serve warm with whipped cream or ice cream. Cooked cobbler fresh out of oven. I think I’m going to continue looking for a recipe that will taste more like my childhood memory – but this one isn’t bad, if you’re looking a way to use some extra fruit you might have. If you use two large cans of fruit, I would recommend doubling the biscuit topping. Maizy played with that thing called a vacuum cleaner today. It is VERY loud and makes me bark a LOT! I can’t figure out if it is something to play with or if I should run away. I wish Maizy didn’t have to play with that thing! Anything that gluten comes in contact with can potentially contaminate gluten-free food. When gluten-containing foods are processed, those foods can leave gluten behind on the equipment, particularly dry foods such as cereals and baking mixes. In addition flour and other fine particles can become air born and hang in the air up to 24 hours before settling on surfaces. When food is prepared in a kitchen that contains gluten, whether at home or restaurant, there is a risk of that food becoming contaminated. It very important for those with celiac disease to pay attention to possible sources for cross contamination. Keep labeled gluten-free condiments. Things like mayonnaise, peanut butter, jelly, and butter can become contaminated when you spread them on bread and place the knife back into the food. Keep clearly labeled gluten free condiments on hand. Clean thoroughly. Clean out cabinets, surfaces, mixers, and anything else that may have gluten on it. Make sure to wash all cooking pans thoroughly in hot, soapy water before cooking a gluten free meal. Buy a new toaster. Toasters can definitely cause cross contamination. Have a gluten free toaster and be sure everyone knows that it is only for gluten-free breads. 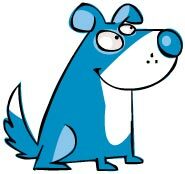 I even buy gluten-free dog food for Milo so I don’t get contaminated when I feed him. He doesn’t seem to notice the difference at all. The key to preventing gluten contamination is to keep things clean and separated. It is important that you train the gluten-eating members in your family to follow these rules so you can stay healthy. It may seem like a big hassle to do all of this, but your health is worth it. Keeping your kitchen gluten-free will become easier with time if you make a routine and stick with it. You can find more information about how to keep your home gluten-free in “How to be Gluten Free” by Linda Etherton. Gluten-free dog food is good, but not as good as COOKIES or BONES. Just sayin’.